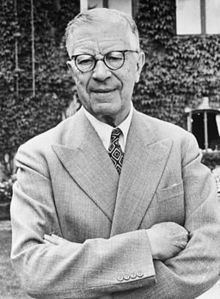 Gustaf VI Adolf (Oscar Fredrik Wilhelm Olaf Gustaf Adolf; 11 November 1882 – 15 September 1973) was King of Sweden from 29 October 1950 until his death. He was the eldest son of King Gustaf V and his wife, Victoria of Baden, and had been Crown Prince of Sweden for the preceding 43 years in the reign of his father. Not long before his death at age 90, he approved the constitutional changes which removed the last traces of political power from the Swedish monarch. Gustaf VI Adolf was a lifelong amateur archeologist particularly interested in Ancient Italian cultures. Gustaf Adolf photographed with his younger brother Prince Vilhelm in 1885. He was born at the Royal Palace in Stockholm and at birth created Duke of Scania. 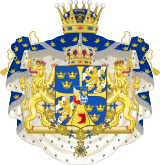 A patrilineal member of the Bernadotte family, he was also a descendant of the House of Vasa through maternal lines. Through his mother, Victoria, he was a descendant of Gustav IV Adolf of Sweden of the deposed House of Holstein-Gottorp. Gustaf Adolf became Crown Prince of Sweden on 8 December 1907, on the death of his grandfather, King Oscar II. In 1938 he was elected an honorary member of the Virginia Society of the Cincinnati. 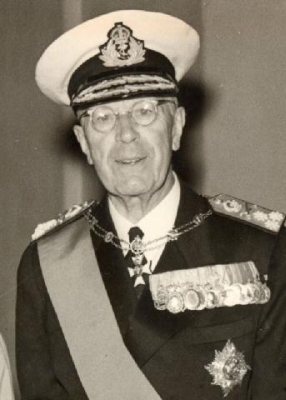 On 29 October 1950, Crown Prince Gustaf Adolf became king a few days before his 68th birthday, upon the death of his father, King Gustaf V. He was at the time the world's oldest heir apparent to a monarchy (this in turn was broken by his great-nephew Charles, Prince of Wales on 2 November 2016). His personal motto was Plikten framför allt, "Duty before all". During Gustaf VI Adolf's reign, work was underway on a new Instrument of Government to replace the 1809 constitution and produce reforms consistent with the times. Among the reforms sought by some Swedes was the replacement of the monarchy or at least some moderation of the old constitution's provision that "The King alone shall govern the realm." Gustaf VI Adolf's personal qualities made him popular among the Swedish people and, in turn, this popularity led to strong public opinion in favour of the retention of the monarchy. Gustaf VI Adolf's expertise and interest in a wide range of fields (architecture and botany being but two) made him respected, as did his informal and modest nature and his purposeful avoidance of pomp. 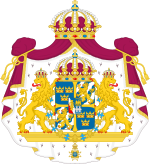 While the monarchy had been de facto subordinate to the Riksdag and ministers since 1917, the king still nominally retained considerable reserve powers. Even these nominal powers were removed when Sweden's constitutional reform became complete in 1975, thus making Gustaf Adolf the last monarch to wield even nominal political power. The King died in 1973, ten weeks shy of his 91st birthday, at the old hospital in Helsingborg, Scania, close to his summer residence, Sofiero Castle, after a deterioration in his health that culminated in pneumonia. He was succeeded on the throne by his 27-year-old grandson Carl XVI Gustaf, son of the late Prince Gustaf Adolf. He died the day before the election of 1973, which is suggested to have swayed it in support of the incumbent Social Democratic government. In a break with tradition, he was not buried in Riddarholmskyrkan in Stockholm, but in the Royal Cemetery in Haga alongside his wives. He was the last surviving son of Gustaf V.
Crown Prince Gustaf Adolf meets some English footballers (c. 1910–1915). The King's reputation as a "professional amateur professor" was widely known; nationally and internationally, and among his relatives. Gustaf VI Adolf was a devoted archaeologist, and was admitted to the British Academy for his work in botany in 1958. Gustaf VI Adolf participated in archaeological expeditions in China, Greece, Korea and Italy, and founded the Swedish Institute in Rome. Gustaf VI Adolf had an enormous private library consisting of 80 000 volumes and – nearly more impressively – he actually had read the main part of the books. He had an interest in specialist literature on Chinese art and East Asian history. Throughout his life, King Gustaf VI Adolf was particularly interested in the history of civilization, and he participated in several archaeological expeditions. His other great area of interest was botany, concentrating in flowers and gardening. He was considered an expert on the Rhododendron flower. At Sofiero Castle (the king's summer residence) he created one of the very finest Rhododendron collections. Like his sons, Prince Gustaf Adolf and Prince Bertil, Gustaf VI Adolf maintained wide, lifelong interests in sports. He enjoyed tennis and golf, and fly fishing for charity. He was president of the Swedish Olympic Committee and the Swedish Sports Confederation from their foundations and until 1933, and these positions were then taken over by his sons in succession, Gustaf Adolf until 1947 and then Bertil until 1997. Gustaf Adolf with his second wife Louise in 1945. Then Crown Prince Gustaf Adolf with his first wife Crown Princess Margareta and children in 1912. Gustaf Adolf married Princess Margaret of Connaught on 15 June 1905 in St. George's Chapel, at Windsor Castle. Princess Margaret was the daughter of Prince Arthur, Duke of Connaught, third son of Queen Victoria and Prince Albert of the United Kingdom. Prince Carl Johan, Duke of Dalarna 31 October 1916 5 May 2012(2012-05-05) (aged 95) later Carl Johan Count of Wisborg. Crown Princess Margaret died suddenly on 1 May 1920 with her cause of death given as an infection following surgery. At the time, she was eight months pregnant and expecting her sixth child. Gustaf Adolf married Lady Louise Mountbatten, formerly Princess Louise of Battenberg, on 3 November 1923 at St. James's Palace. She was the sister of Lord Mountbatten and aunt of Prince Philip, Duke of Edinburgh. It was Lady Louise who became Queen of Sweden. Both Queen Louise and her stepchildren were great-grandchildren of Queen Victoria of the United Kingdom. His second marriage produced only one stillborn daughter on 30 May 1925. While his first wife visited her native Britain in the early years of their marriage, it was widely rumored in Sweden that Gustaf Adolf had an affair there with operetta star Rosa Grünberg. Swedish vocalist Carl E. Olivebring (1919–2002) in a press interview claimed to be an extramarital son of Gustaf VI Adolf, a claim taken seriously by the king's biographer Kjell Fridh (1944–1998). King Gustaf VI Adolf of Sweden was the grandfather of his direct successor King Carl XVI Gustaf of Sweden, of Queen Margrethe II of Denmark and also of former Queen Anne-Marie of Greece. His title used in official documents was: Gustaf Adolf, by the Grace of God, Sweden's, Gothia's and Wendia's King (Swedish: Gustaf Adolf, med Guds nåde, Sveriges, Götes och Vendes Konung). 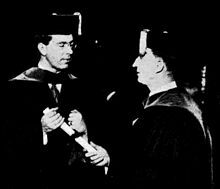 In 1918, Gustaf VI Adolf received an honorary doctorate at Lund University, in 1926 an Honorary Doctorate at Yale, Princeton and Clark Universities, at Cambridge in 1929 and in 1932 at the University of Dorpat. Upon his creation as Duke of Skåne, Gustaf Adolf was granted a coat of arms with the arms of Skåne in base. These arms can be seen on his stall-plates both as Knight of the Swedish order of the Seraphim in the Riddarsholmskyrkan in Sweden, but also the Frederiksborg Chapel in Copenhagen, Denmark, as a Knight of the Danish Order of the Elephant. 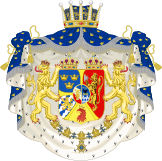 Upon his accession to the throne in 1950, he assumed the Arms of Dominion of Sweden. Wikimedia Commons has media related to Gustaf VI Adolf of Sweden. ^ Magnusson, Jane (25 November 2011). "När Martin Luther King träffade kungen". Dagens Nyheter (in Swedish). Retrieved 22 March 2016. ^ "Lady Louise Mountbatten". Mariees du Gotha. Archived from the original on 28 April 2015. Retrieved 26 April 2015. ^ Elgklou, Lars (1978). Bernadotte: historien - och historier - om en familj (in Swedish). Stockholm: Askild & Kärnekull. p. 170. ISBN 91-7008-882-9. LIBRIS 7589807. ^ Fridh, Kjell (1995). Gamle kungen: Gustaf VI Adolf : en biografi (in Swedish). Stockholm: Wahlström & Widstrand. ISBN 91-46-16462-6. LIBRIS 7281986. ^ "Reply to a parliamentary question" (pdf) (in German). National Council. p. 95. Retrieved 5 October 2012. ^ "No. 43174". The London Gazette (Supplement). 29 November 1963. p. 9907.